One of our specialties is creating stress-free Costa Rica family vacations. Browse these customizable packages to get started and let us create a vacation you’ll remember forever! You and your family will enjoy the best of the beach and the volcano at two deluxe resorts. Adventure, deluxe accommodations and amazing experiences - everything is included! Exciting tours await! Zip through the canopy around the volcano, relax on a safari float as you watch nature drift by, and discover a private beach! Take your family on an exhilarating flight through the jungle on a zip line, then go off to the coast to get up close with nature. This has something for everyone! If you're looking to spend an exciting extended vacation with your family trekking through Costa Rica, we have the package for you! You'll make lifelong memories as you spend time together exploring paradise. Costa Rica comes to life during the green season—flowers are in bloom animals are active. What better time to come visit with your family? Stay in two of Costa Rica's most luxurious resorts and enjoy tons of 5-star amenities with your exciting volcano and beach adventures. Costa Rica is the perfect place to take a family vacation, and this package will give you the best of what makes the country a favorite. Rainforests, volcano views, beach relaxation - you’ll experience it all. Visit a volcano and a beach and have great adventures! Enjoy a river float and a family surf lesson with plenty more to choose from! Get up close with nature in the best of accomodations. Your family will always remember this mountain, river, and beach customized Costa Rica adventure! Have an adventure-filled vacation—cloud forest and Manuel Antonio beach with all tours included—while staying at Costa Rica's famous eco-hotels. Having been in business since 1999, we have the experience, expertise, and in-country customer service that offer complete peace of mind when planning your Costa Rica family vacations. We will take the time to understand your exact needs so we can design a trip that fits you and your loved ones perfectly. Traveling to Costa Rica with kids doesn’t have to be difficult. We know that the last thing you want when you are with your family on vacation is to think about logistics, booking issues, or problems. When you book our Costa Rica family vacation packages, you also have access to our 24/7 customer service team. Never worry about anything, we’ll take care of it! No matter how diverse your family’s interests, our Costa Rica based travel agency can handle them! From toddlers and tweens to teenagers and grandparents, we tailor Costa Rica family vacations to cater all ages and tastes. Whether you have an action-packed or easy-going holiday in mind, we customize our Costa Rica family vacation packages to your preference. If you need a combination of activities for different members of your family, consider it done. Tell us what you want, and we’ll make our best to accommodate you. Options are abundant. For those looking for adrenaline we offer various experiences, all from whitewater rafting to outdoor excursions. If you are looking for a more relaxing Costa Rica family vacation, there are pools and volcanic hot springs where you can lounge in peace or let the kids play. Are you a nature lover? Take in the sights and sounds of wildlife with guided jungle walks or whale watching tours. There’s something for everyone! Once you know WHAT you want to do then give some thought to WHERE you want to do it. Costa Rica has a variety of landscapes and hotels to match. Do you want to be by a beach or looking at a volcano? How about both? We can tailor family vacations to be a multi-destination trip. There is also no shortage of accommodations for your Costa Rica family travel. 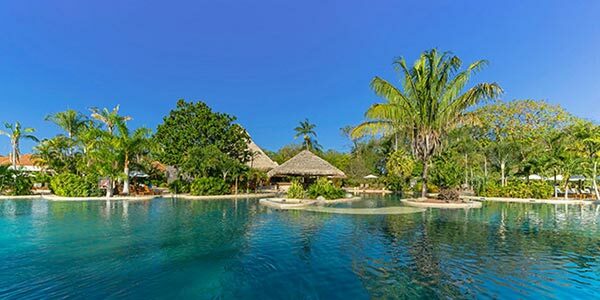 Since we live here, we have personally stayed in all of the options we offer: from the large and luxurious for an all-inclusive family vacation, to boutique eco-resorts, hotels, and lodges for a catered set of interests. Our team of local experts can share every detail with you so you know what to expect. When you think about your next family vacation, consider Costa Rica and let our team work with you to create a unique experience that will satisfy your entire travel group. We also offer a 100% money back guarantee on our Costa Rica family vacations, so you know you will love traveling with us. What do you do if there is an emergency when you are on vacation, or even if you just need some advice? Booking yourself or with a ‘faceless’ agency can leave you stranded and somewhat alone. When you book with Costa Rican Vacations, you can rest assured that no matter what happens on your vacation you have an entire team of people, here in Costa Rica, waiting to help you and your family. Our travel experience team have resolved with success and speed a large range of requests and unexpected complications. From dealing with medical emergencies, making arrangements for lost passports, or just offering helpful advice, we are one call away all day and night. If you and your family want to book additional tours, need to request special items, or just want to discuss the best options for dinner, call us as well. We’re happy to help! Knowing that your family is in safe hands and that you have all the support you could ever need will make your family trip that much less stressful and much more enjoyable. After all, don’t you and your family deserve the best? So don’t delay, contact us today and discover how our in-country travel experience team can help make your Costa Rica family vacations an incredible experience. Interested in learning more? Our Costa Rica expert, Rodo Alvarez hosted a webinar, Guide to Family Travel in Costa Rica, with Tara Cabantingan, our Travel Consultant and guest speaker. What destinations to pick that will best suit your needs? Which hotels are family-friendly? Can you trust your kids with babysitting services? What tours are most suitable for your family members? Get insight on these questions and other tips we share with our clients when planning a trip to Costa Rica! Before coming down here, purchase UV 50 waterproof swim pants and shirts! The sun is stronger here than in moderate climates, and your kids will be safe coming in and out of the water all the time. Buy one for yourself, too!